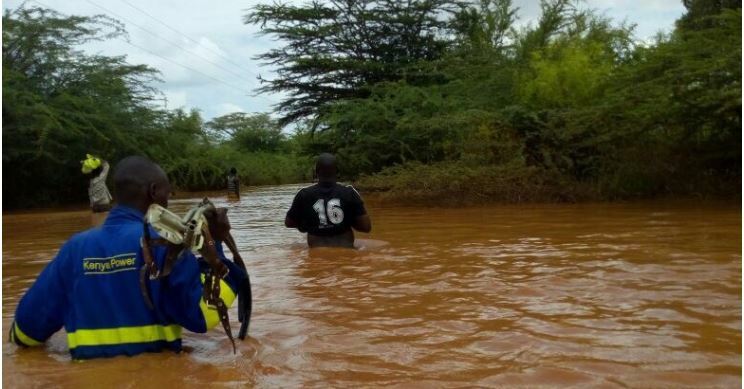 Kenya Power officials wade through the floods in Tana River County. The government on Tuesday evening warned people living downstream from the Seven Forks power dams to evacuate immediately or risk the wrath of flood waters. Energy Cabinet Secretary Charles Keter said water levels at the Masinga Dam are now at 1055.53 meters compared to a full capacity of 1056.50 meters, with little time left before it overflows. According to Keter, this is the first time all the Seven Forks dams- which include Masinga, Kamburu, Gitaru, Kindaruma, and Kiambere -are recording high water inflows since 2015. Masinga feeds Kamburu, Kindaruma, Gitaru and Kiambere. Once Kiambere Dam overflows, it is expected that it would take four days for the water to get to Garissa Town and soon after the lower Tana Delta. “In the event the water levels continue to rise, communities that live on the banks of River Tana, downstream of Kiambere Dam, are urged to take the necessary precaution, those who live in Garissa, Hola, Bura and Garsen should move to safer grounds,” he added. He urged everyone who lives near the dams and along the Tana River to move to safer grounds by Friday. The move comes after 48 people were killed in Nakuru as Solai Dam burst its walls last week.